J.D. Crowe is in fact one of the greatest bluegrass stars of all time. He comes to WoodSongs to help us celebrate his legacy career, amazing banjo style and his recent honors from the University of Kentucky. 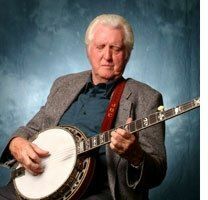 Crowe began playing the banjo early and was offered a job with Jimmy Martin's Sunny Mountain Boys in mid-1950s. In the late 1960s, Crowe formed the Kentucky Mountain Boys, principally performing in the Lexington, Kentucky region. By the early 1970s, Crowe changed the band's name to The New South, widely considered one of the most influential bluegrass groups in history. Many influential musicians have been a part of the band over the years, including Keith Whitley, Ricky Skaggs, Tony Rice, Jerry Douglas, and Doyle Lawson. Part of the evening will be devoted to JD talking about his banjo style and introducing young, new players to the audience. The young banjo player frequently played on local radio stations, and that is where he got his first major break in 1956. Jimmy Martin was driving through Lexington when he heard Crowe on the radio station, and was so impressed with what he heard that he drove to the station and asked him to join his band, the Sunny Mountain Boys. Crowe immediately accepted and began touring with Martin. While he was in the Sunny Mountain Boys, Crowe didn't stick to a strict bluegrass set list -- he often added rock & roll songs to his repertoire. Brandy Miller is a 15 year girl from North Carolina who has won several banjo awards. JD Crowe is one of her banjo inspirations and we thought it would be fun to have her on the show to go pick-to-pick with her. Bring your own seat belts! Brandy found her talent in the banjo at the early age of 6. Since that day, she has been entering fiddler's conventions, playing in bands and most recently has been accepted into the International Bluegrass Music Association Kids on Bluegrass program in Nashville, Tn. In June of 2012, she was ask to Tom T. and Dixie Halls' Studio in Franklin Tn. to record banjo on the new Daughters of Bluegrass project. Brandy is now an official Daughter of Bluegrass. Brandy's accomplishments began when she started playing on stage at Sims Country BBQ at the age of 6 with The Dollar Brother's Band for the kids square dance. Since then, she has taken home many ribbons from fiddler's convention in North Carolina and Virginia. Brandy took home first place in the adult bluegrass banjo at the 77th Old Time Fiddlers Convention in Galax Va. Brandy takes lessons from two time national banjo champion, Steve Lewis. When Brandy is not performing with her band, you can find her using her talent with different bands such as, The Dollar Brothers Band, Johnny and Jeanette Williams Band, Steve Lewis and Friends and many others.